A beautiful matching set comprising a natural rose dipped in 24K gold, a heart-shaped pendant and pair of drop earrings. 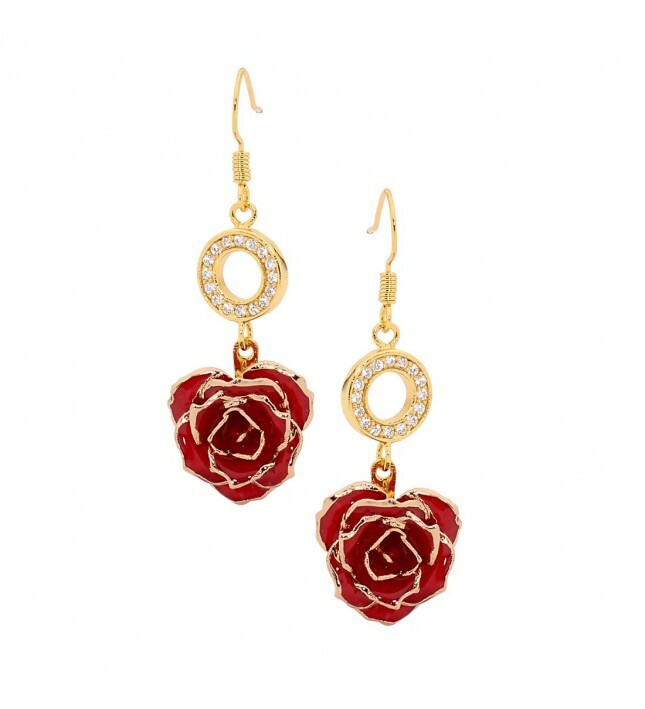 The jewellery is styled in a romantic heart design incorporating 37 radiant synthetic diamonds which encrust the earrings and pendant. Each set comes complete with a stylish leather presentation case. Beautiful intricate detailing supported by lifetime guarantees. Rapid dispatch and fast delivery. 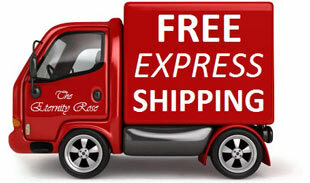 Orders are processed within just hours and two-day transport is arranged at no extra charge. 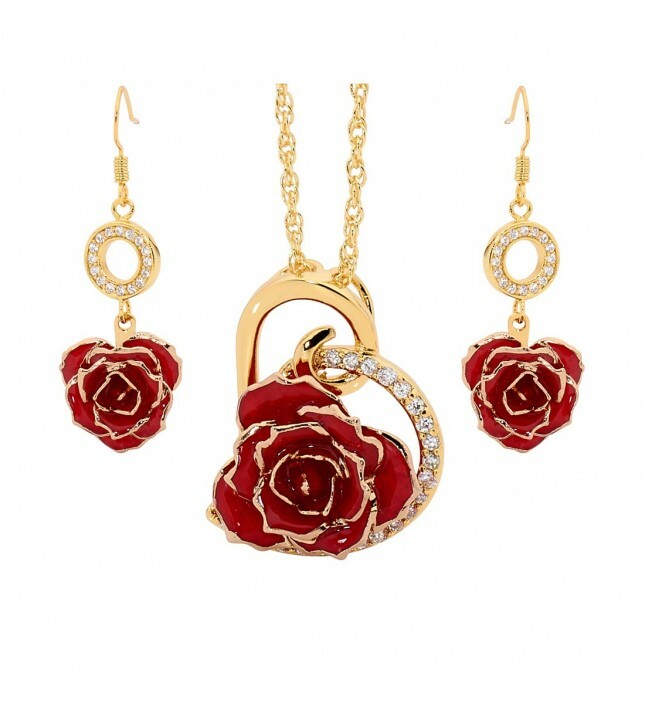 A gorgeous matching set featuring our 24 karat gold heart design. 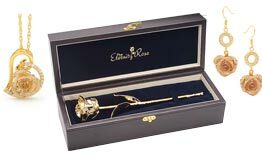 A 24 KARAT GOLD-DIPPED ROSE, with a length of approximately 11.5". 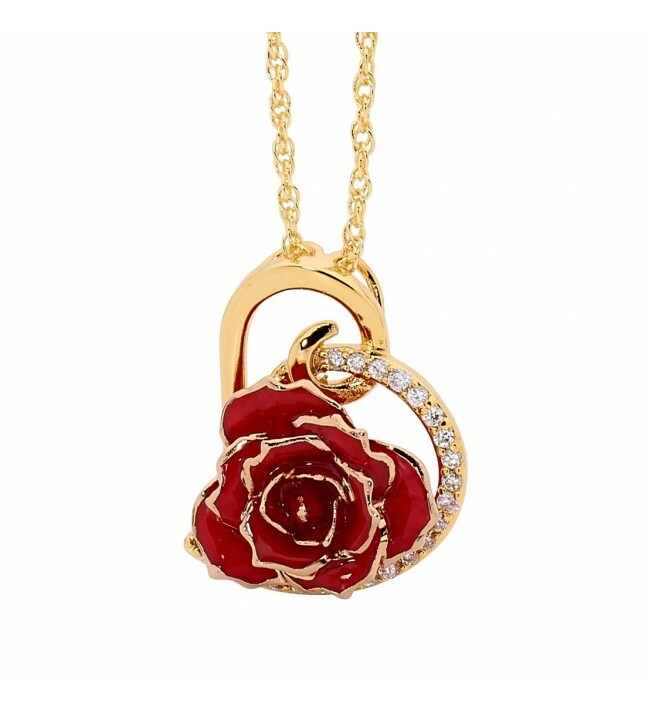 A PENDANT created from real miniature red rose petals, intricately glazed and decorated with 24 karat gold. A stylish matching 24k gold-dipped multilink chain is included. 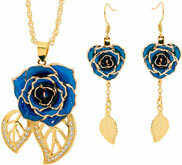 The diameter of the pendant rose head measures approx. ¾”. The pendant is heart-shaped and studded with 21 radiant synthetic diamonds. The pendant's overall dimensions are 1.2” x 0.9”. 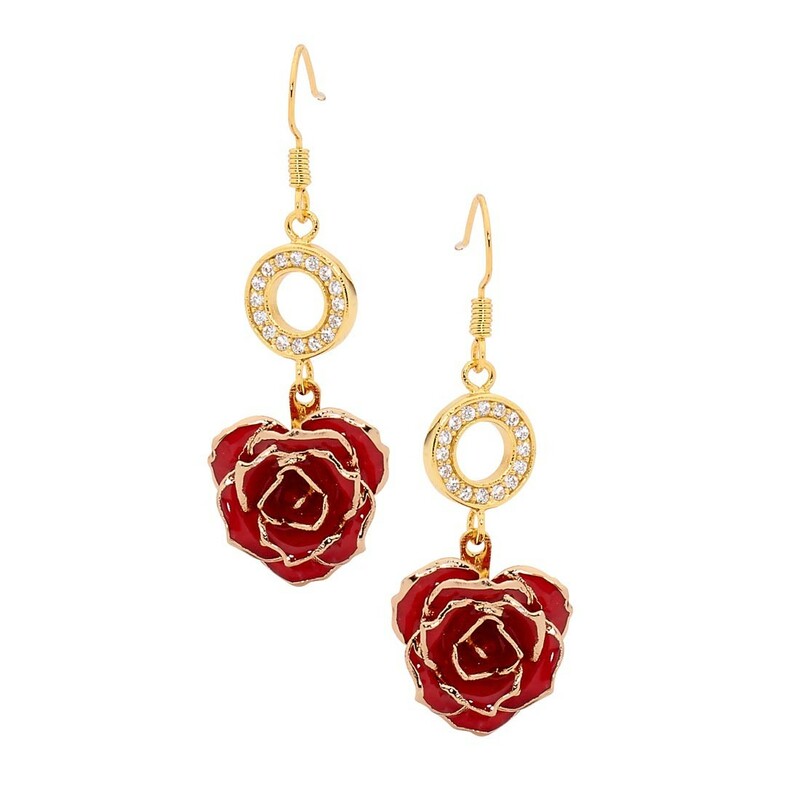 A PAIR OF EARRINGS made from real miniature red rose petals that have been glazed and decorated with 24k gold. The rose head has a diameter of approx. 5/8”. The earring drops are approx. 1.7” in length and feature a gold ringlet decorated with 16 brilliant synthetic diamonds. 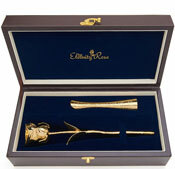 Each set comes with a prestigious leather display case with a velvet lining. The case measures 13.3” x 4.8” x 4”. 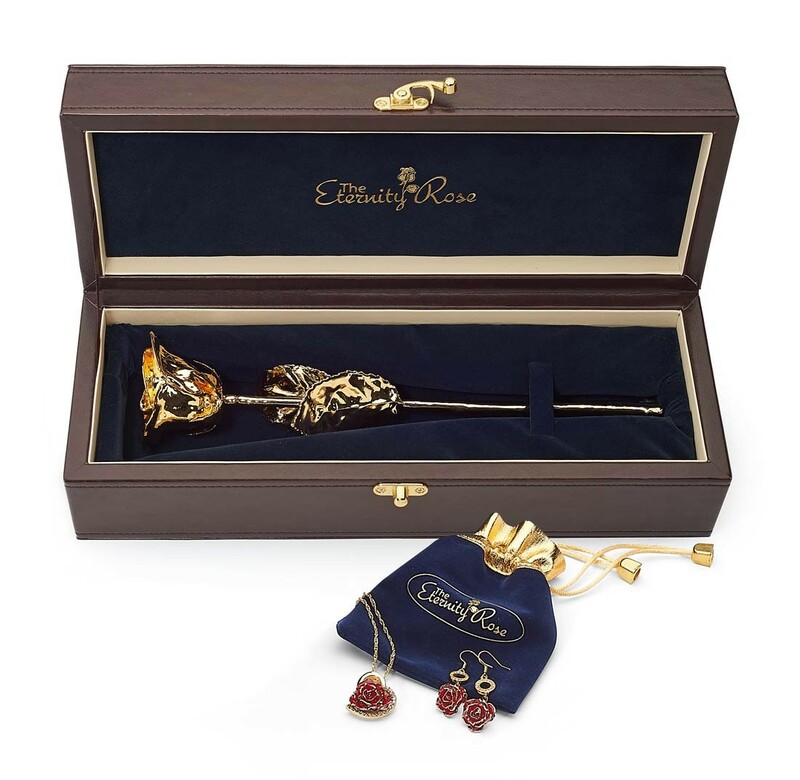 Within the rose presentation case, you will find a navy-blue pouch containing the jewellery. 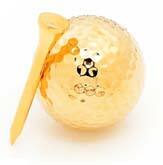 All jewellery items have a coating of fine 24 karat gold. 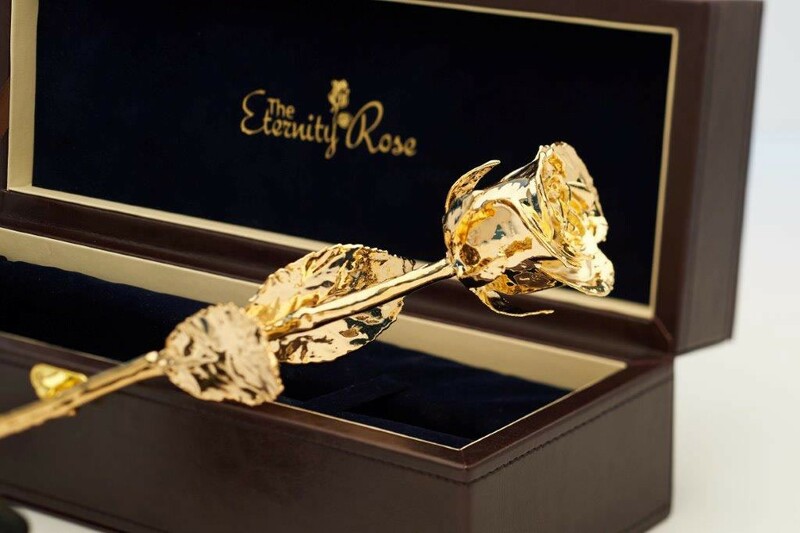 Every item in The Eternity Rose collection requires consummate skill and exquisite workmanship. 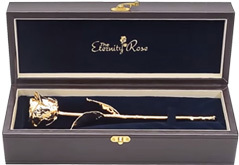 The glazing and gold-trimming of the rose petals takes more than three months and requires a 60-step procedure to reach completion. 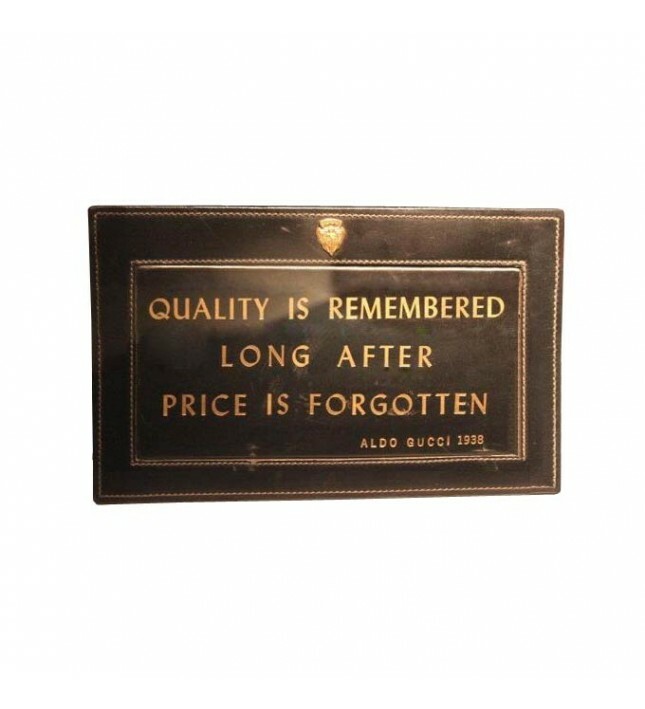 Every item is crafted by hand to the highest standards, resulting in a unique piece of art. 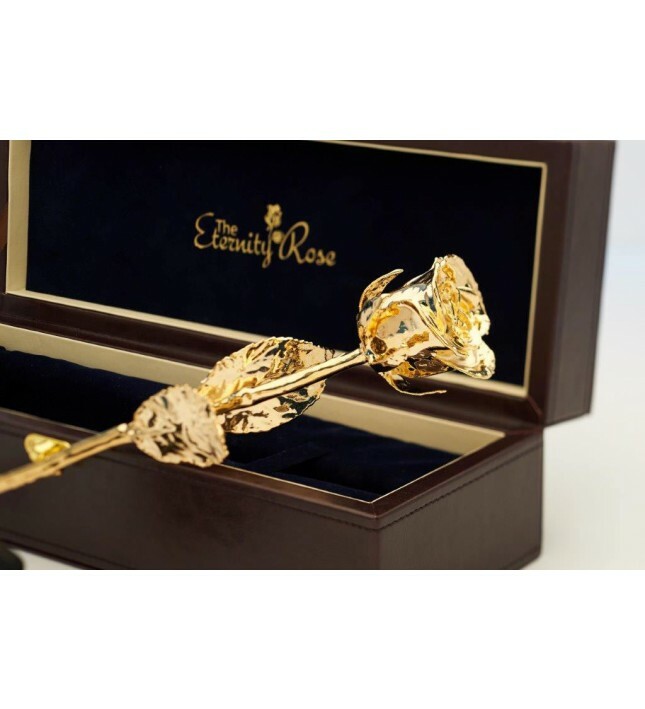 Like every item in The Eternity Rose range, the quality of these items is guaranteed with a lifetime warranty. 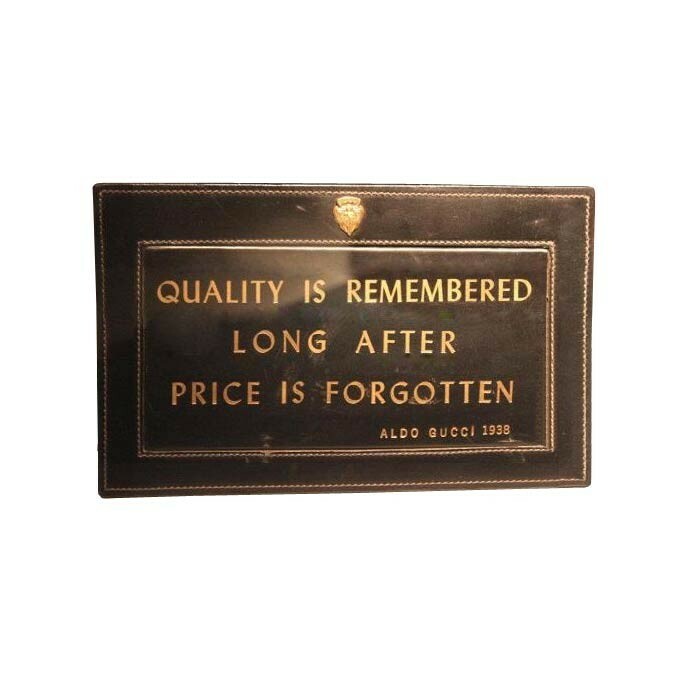 We subject all of our products to close scrutiny until we are satisfied that they meet the highest standards in Europe. Our pieces have won awards for their excellent quality and design, and we spare no expense in perfecting the quality of every crafted set. 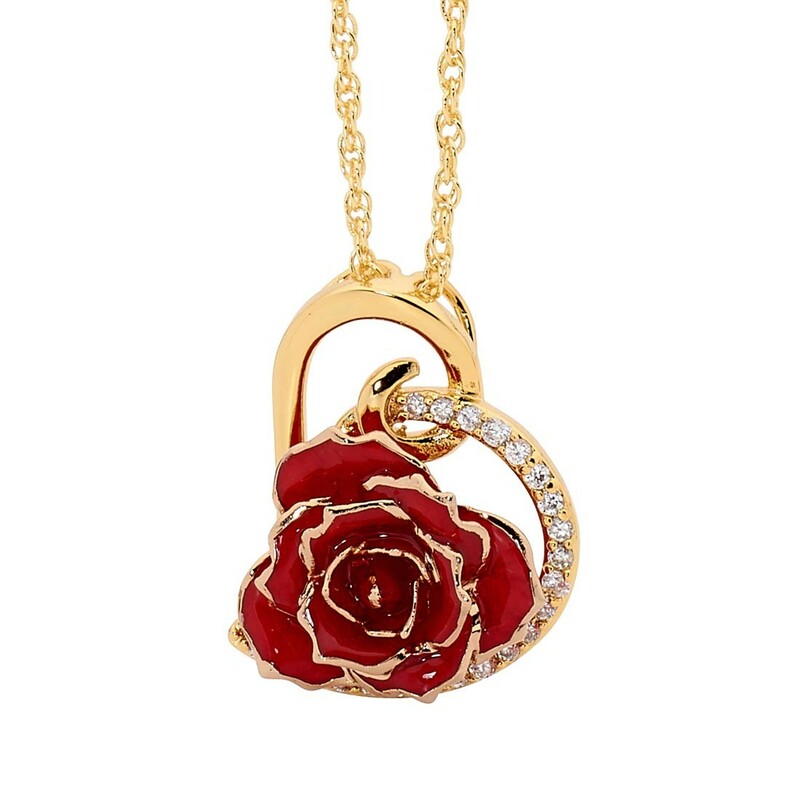 What better gift for the lady who loves beautiful jewellery and the elegance of natural roses? 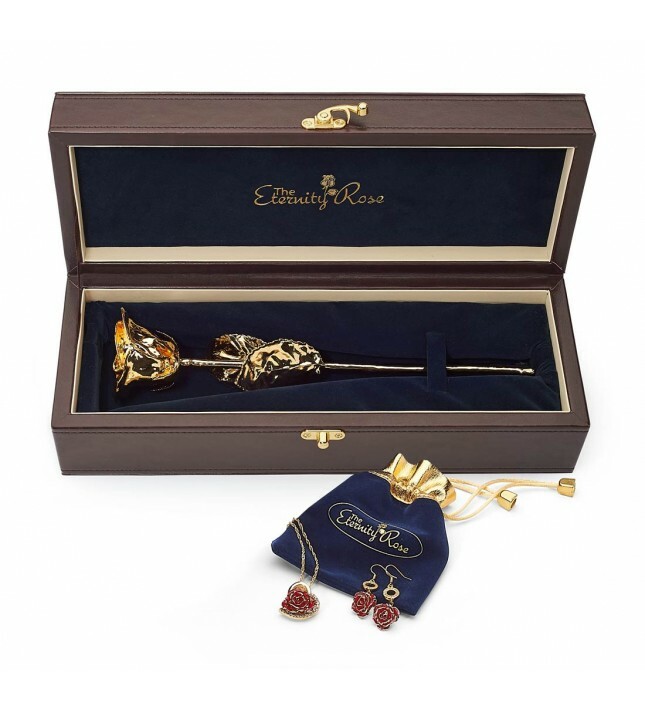 The jewellery that comes in this set with a gold-dipped rose is also available in a classic leaf-style theme which details golden leaf figurines in the earrings and pendant.